We are first going to head for the bus turning area and small unofficial car park at the west end of the village of Bowness. From here we can survey the vast estuary that is the Solway Firth. To the west are the remains of the bridge that used to carry the Solway Junction Railway across the water to Scotland (and, before it was dismantled, the occasional drunken reveller – seeking to bypass national drinking laws – to their watery doom). According to Bishop Nicholson, writing in 1707, the terminus of the Wall lay a quarter of a mile west of the village and other writers confirm his observation. The phrase ‘there is nothing to see now’ can safely be deployed here for the first time. To the north, across the estuary, lies what is now Scotland but was in Roman times Caledonia (please note: no Picts were harmed in the making of this mural barrier, since they were almost certainly not around until long after it was constructed; the Picts’ Wall was a local term that came to be used to describe the Wall in the post-Roman period). 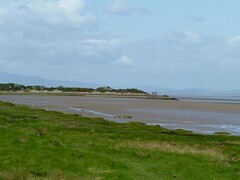 To the east is the low drumlinoid that provides the slightly elevated platform for the fort of Bowness-on-Solway. This is as good a place as any to contemplate how the emperor Hadrian’s visit to Britain in AD 122 (a date you will find hard to forget, as it is now the number of the Hadrian’s Wall bus, although that no longer ventures as far as Bowness, sadly) led to the construction of this massive monument, unique in form in the Roman world. Why did he do it? In the Historia Augusta, his biographer offers a simple explanation: ‘he was the first to construct a wall, eighty miles in length, which was to separate the barbarians from the Romans’ (HA Life of Hadrian, 11). We now need to proceed east up the road and into the village as far as the King’s Arms pub at the T-junction. As we do so, we enter the site of the fort of Bowness (MAIA). The fort of Maia lies beneath the village of Bowness. The name means something like ‘bigger’ (a goddess of that name is known) and, at 2.3ha, it was second only in size to Stanwix. 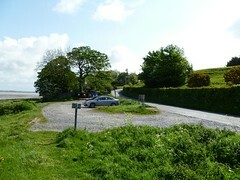 The significance of its location, apart from the conveniently raised ground of the drumlinoid, is that it is (or was) the lowest fording point of the Solway Firth. The remains of the fort were evident when Camden visited in 1599 (‘tracts of streetes, ruinous walles, and an haven now stopped up with mud’), but there is now nothing to be seen of its fabric. A noticeboard on the side of the King’s Arms has a plan, together with some useful information. Having read that, if we then continue east down the main street, approximately 80m from the corner of the pub is a low byre on the right with a blocked doorway. 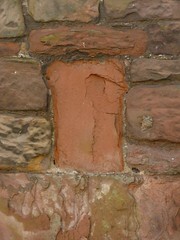 Examine the lintel with the eye of faith and you may recognise that it is a small Roman altar of red sandstone (the principal Roman building material around here). Its inscription was still legible in the 19th century, but did not mention the garrison of the site, which was probably an 800-strong infantry unit (a cohors peditata milliaria). Milecastle 80 has not been found. Not a good start, you might think, but it is assumed it was demolished to make way for the fort, so it will only ever have been made of turf and timber and not rebuilt in stone. Why this should have happened will become apparent when we come to mull over the so-called Forts Decision. For the time being, it will suffice to note that milecastles normally occurred every Roman mile (1,000 paces or 5,000 Roman feet, or approximately 1,479m or 1,617yds: ‘approximately’ because Roman miles – generally measured by pacing – tended to vary slightly) but that a combination of the difficulty of exact measurement in the past, and the need for pragmatism for signalling and observation purposes, means there was evidently some ‘wriggle room’ in their placing. Unless you are desperate to get a Trail ‘passport’ stamped at the incongruous little shed that lurks off the main street, you may now exit the village, passing close to the position of the east gate of the fort, and begin your unorthodox exploration of Hadrian’s Wall. I’m sure lots of people have blogged walking along Hadrian’s Wall, but it occurred to me that nobody seems to have done this from an archaeological point of view. At least, probably not for the whole Wall; and almost certainly not from west to east. In reality, this is an aggregate of several journeys since, like a good film, you can never take it all in at once. So, where to start? 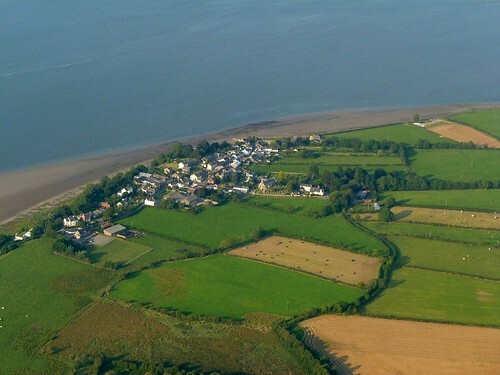 Let’s head for the pretty little Cumbrian village of Bowness-on-Solway. You will probably need to do this by bus (a 93 from Carlisle bus station), although William Hutton was quite content to walk there from Birmingham. If walking the Wall in pairs, it is possible to try the Two Car Trick (definitely not to be confused with the famed Shakespearian Bed Trick). This involves driving two cars to the anticipated terminal point of the day’s walking, leaving one there, driving back to the start, leaving the other there, then starting to walk. At the end of the day, get in the car you (hopefully) rediscover at your destination, go back to the first, then retire for a night’s rest. Not very green, and problematical in the Central Sector, where parking is (deliberately) scarce, but one way round the gaping inadequacies of the British public transport system.